2 chambres 2 salles de bain maison dispose mise à jour des appareils en acier inoxydable, d'une télévision à écran plat, a récemment acheté un canapé-lit en coupe et nouvelle reine et des matelas en taille réelle. Projeté dans véranda comprend salle à manger, un canapé extérieure et Weber Grill. Laveuse et sécheuse sur place. Coin salon extérieur par quai où vous pourrez vous détendre et voir les lamantins nagent ou vous essayez à la pêche pour le Tarpon insaisissable ou Mangrove Snapper. I was in town for a month on business and I couldn’t of asked for a better place to relax. It’s quiet and it’s in a great location. I got to see manatee playing daily and even a crocodile in the canal. The owners were awesome to deal with and if I’m back in town I’ll look to stay there again. A little piece of paradise away from home. We found the property well kept, clean and exactly as described. We thoroughly enjoyed taking our meals on the screened in porch. We even saw an alligator and a couple of manatees in the channel by the house. If you like to walk there are enough areas to do that and the Winn Dixie is in walking distance. There are many great eateries and bars nearby. Bob and Cheryl provided a 3-ring binder with information about places to eat and things to do with discounts for some events and activities. We really enjoyed The Spot. The house was immaculate, comfortable, and well appointed. We ate daily and relaxed on the lanai. The kitchen had everything we needed with nice appliances and great glasses for cocktails. We saw manatees on several occasions, one with a baby, and lots of jumping fish and birds. The neighborhood is quiet. Snorkeling at Pennekamp was fantastic and the restaurants (especially the Fish Market and the Encore) were delicious. We have tans which will fade, ten extra pounds to get rid of, and fond memories to keep. Perfect for our type of vacation! We love to fish & snorkel, so this place fits the bill! We fished and snorkeled everyday using the dock for loading and unloading rods, coolers, snorkel gear, which is extremely difficult if we kept the boat at a marina. The large screened in porch was perfect for us to stow all our gear and we used the fish cleaning station almost everyday. We went out for sunset boat rides and tried out several waterfront restaurants/bars. Our favorite was Hobo's Cafe, (not waterfront, but so good it does not matter! ), they specialize in Hog Snapper, Mahi, Grouper and Yellowtail, all my favorites. 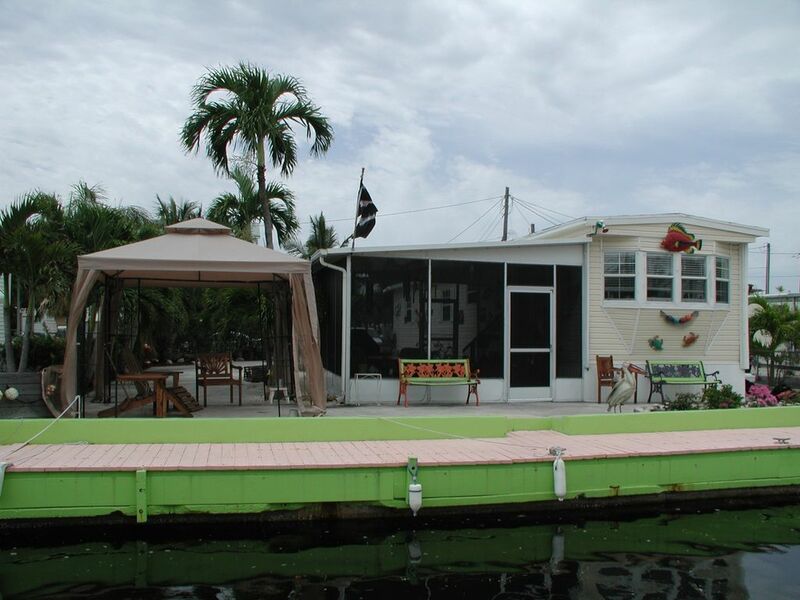 The location has easy access to the bayside and you can get to the Atlantic side by going through Adams Canal just a mile south. We snorkeled all over Pennekamp and found several spots not on the map that we marked for next year. The kitchen/living room area was great for everyone to hangout during the afternoon thunderstorms and two showers is a great advantage. We will be back again next year!! Good location especially if you have a boat. Very close to Miami with great sunsets. The owner couldn't have been nicer or more cooperative and responsive to our needs. I am so very glad that we stayed here. We will definitely be back! The place was clean, and had every possible amenity that you could think of (DVD player, blender, pots, pans, tons of towels, extra blankets, crab pod, games, etc...long list.) Robert was extremely helpful, and accommodating as well. Anything we needed he was very quick with his responses. Neighbors are super friendly, and they will direct you to any of your needs. One lady actually came over and corrected my husbands "fishing techniques" which was hilarious for me to watch :) We did a fishing charter in Key West that was unsuccessful. When to Harry Harris Park (which is great for families), rented kayaks from Florida Bay Outfitters (absolutely awesome) and did our own "eco tour" saving $350. There is a Dollar Store, and grocery store (Win-Dixie) very close by. You have to check out Key Largo Chocolates and Ice Cream (NOT ALL KEY LIME PIE IS CREATED EQUAL! ), but the stuff there is amazing. Overall amazing trip other than our sunburn :) Hope you decide to stay here, you won't be disappointed! Si vous aimez le soleil et l'eau cet endroit est fait pour vous, si vous voulez vous détendre sur le quai et regarder le soleil se coucher ou faire du kayak ou de la navigation de plaisance et de la nature aperçu en jeu. Les lamantins et les dauphins sont visibles comme le sont les iguanes qui dorment dans les arbres de la mangrove. Vous remarquerez pélicans, hérons, aigrettes et perroquets parmi les différents types d'oiseaux dans la région. Il ya plusieurs tournées vers le récif pour la plongée en apnée ou en plongée de John Pennecamp State Park ou vers le bas au mile marker 100 sur le Oceanside. Plusieurs des marinas ont 1/2 jours et profondes excursions de pêche de la mer d'une journée complète pour le novice et le pêcheur sérieux. Prendre un lecteur à US 1 à Key West et profiter de la vue est un excellent moyen de passer une journée. Il est le Turtle Hospital à Marathon qui est une grande destination et le Musée Diver est très agréable et instructif. Différents restaurants de la région sont des délices culinaires - The Fish House et Encore, Sundowners et Snooks sont tops - plats légers peuvent être trouvés à Gilberts Resort avec musique en direct la plupart des jours. Autres favoris sont la Buzzards Roost et naufrages. Si vous aimez chèque de cuisson sur les Keys Fisheries au mile marker 99. 5 sur le Oceanside pour le poisson frais et de crustacés. De toute façon vous sera bien nourri dans les Keys! Pets are considered on case to case basis.